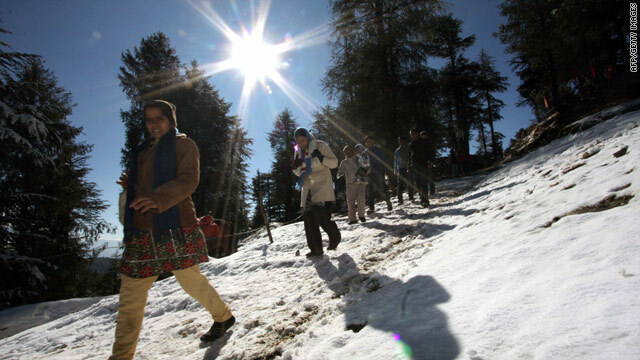 Tourists walk on fresh snow Monday near Shimla in Himachal Pradesh, northern India. New Delhi, India (CNN) -- A biting cold snap lingered across sections of northern India Monday, hitting the homeless hardest in some of the country's most impoverished regions. At least six people were feared dead because of intense cold in the eastern state of Bihar, Disaster Management Minister Devesh Thakur said. Temperatures have been as low as 5 degrees Celsius (41 degrees Fahrenheit) since Thursday in parts of the state, he added. The homeless and the elderly have suffered the worst, Thakur said. District authorities have been ordered to build fires in vulnerable neighborhoods to keep residents warm. India's main weather office said day temperatures were 5 to 10 degree Celsius below normal in Uttar Pradesh, Punjab, Haryana and parts of Rajasthan and West Bengal states. Media reports pointed to scores of additional deaths in Uttar Pradesh due to the extreme weather, but those figures could not be immediately confirmed with authorities there. More than 160 million people live in India's fourth largest state.